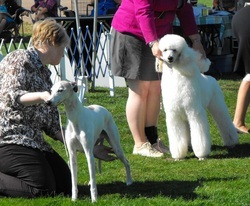 The Campbell River Dog Fanciers Society began in 1977 under the name Campbell River Dog Club. Founding members were Cathy Merrithew, Heather Somers and Sandra Todosychuk. Dale Merrithew (Honorary Life Member) was influential in the club’s early years. The CRDFS held their first licensed Canadian Kennel Club Championship Shows and Obedience trials on the BC Day weekend in 1984 at Phoenix School (previously the Campbell River Junior Secondary School). Some of these first shows (August 1986 on) also saw Campbell River’s own flyball team competing and often winning fly ball tournaments held in conjunction with the show. In 1993 the CRDFS moved their CKC shows and trials to Nunns Creek Park. These show grounds proved to be the perfect place to hold their event. Many exhibitors return year after year and comment on how nice the show grounds are. Working as part of the Nunns Creek Park Users Group the club was able to help make improvements to the park. The Dog Fanciers have hosted many other events. Besides the CKC Shows and Trials there have been Tracking Tests, Temperament Tests, Obedience trials through the Association Of Island Obedience Clubs, Canine Good Neighbor tests, a first aid seminar for dogs, a seminar on feeding raw diets, obedience seminars and structure and movement seminars, to name a few. 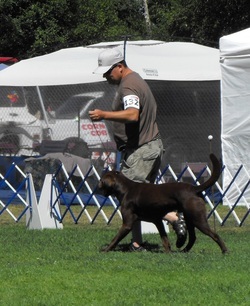 Members are active in or have competed in obedience trials, CKC Championship shows, lure coursing (races for sighthound breeds), terrier trials, hunting trials, agility, tracking, flyball, schutzhund trials, herding trials, and the newest dog sport Rally-O. Several members are involved with hospital visits with their therapy dogs through PATS (Pacific Animal Therapy Society). Members have given demonstrations at the Ironwood Mall, Yuculta Lodge, Extended Care, schools, Brownie and Cub Scout groups. Another fun event was the Kiddies Dog Show. Here prizes were given for longest ears, shortest tail and best-groomed dog as well as many other fun categories. An annual event for the CR Dog Fanciers is an eye clinic. This is where an ophthalmologist screens dogs for eye abnormalities and genetic defects. The main goal of the Campbell River Dog Fanciers Society is to promote Responsible Dog Ownership. This means to have well behaved dogs with educated owners. Obedience and show handling classes are offered from September through to June.